Editors Note: This report on SOLY was originally published on March 11th at $5.85 and sent to Tipping Point Stocks Members with a $16 12 month target. As of this update, the stock is at $9.40 on April 2nd up 60% for Members. We also had over 100% gains this year on HYRE from $3.50 to $8 and 400% on SOLO from $1.25 to $6. Consider joining!! Share Target is $16 plus in 12 months from $5.60 area. Maximum Entry 6.25 suggested adding to 5.25 on dips. Recent IPO of an exciting new medical technology company affiliated with the MD Anderson Cancer Center. SOLY went public in February at $5 and is just now breaking out on some volume from the POST IPO base pattern. Soliton has licensed a proprietary technology for tattoo removal and potentially now for cellulite reduction and is in the process of completing further clinical and pre-clinical trials before bringing the Soliton’s Rapid Acoustic Pulse to a massive market. Soliton is unique in that it seeks to remove tattoos using a proprietary shockwave technology, instead of the traditional laser tattoo removal technique that is often criticized as uncomfortable, expensive, and time-consuming. Soliton’s Rapid Acoustic Pulse (RAP) device not only can dramatically accelerate the process, but the company has found in recent clinical trials that the device may have applications with for reducing cellulite appearance and improving skin laxity. As a result, Soliton — founded in 2012 — has begun a collaboration trial with a large global aesthetics company (Allergan?) in hopes of entering the fat reduction sector. A typical tattoo removal can take as many as 1–2 years and as many as 10 office visits. Soliton aims to improve customer satisfaction significantly. In a recent clinical trial, 100% of patients were able to completely remove their tattoos within just two or three office visits using the Company’s RAP device, in conjunction with a Q-switched laser, versus the industry average of 10 or more with a stand-alone laser with much lower costs and much less pain. 38 patents issued and or pending in China and more pending in the US, both large markets. They are finding more uses for the device which would dramatically expand their market opportunities. With an 85 million market cap and FDA marketing submission around the corner for Tattoos, there is significant potential upside here in the shares post IPO. Reminds us of ZELTIQ which we wrote up in late 2013 at a 600 million market cap on seeking alpha and they were bought out in 2017 for 2.5 Billion by Allergan. 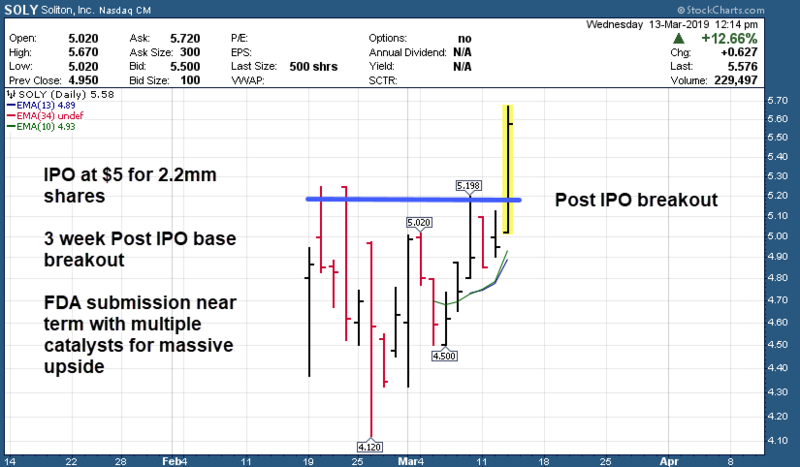 After completing a 3 week rounding POST IPO base this breakout should continue as investors catch on and quiet period is ending. Ringing the closing bell on NASDAQ next Tuesday, usually same company is on CNBC. Given the valuation accorded to ZELTIQ when bought out by Allergan in 2017 and the dual nature of both Tattoo Removal and possibly Cellulite reduction with this device by Soliton, and the likely Joint Venture underway with Allergan now, we think the shares can appreciate materially from here for as much as a triple in 12 months. Share Target is $16 plus in 12 months from $5.60 area. Buy Advice: Maximum Buy is $6.25 given our very high share price target in 12 months or less, and looking to add down to 5.25 area.